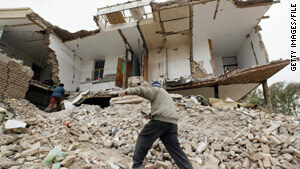 Survivors of an earthquake search debris in Bam, Iran, in late 2003. That quake killed tens of thousands of people. (CNN) -- Women who dress provocatively and tempt people into promiscuity are to blame for earthquakes, a leading Iranian hard-line cleric has apparently said. The prayer leader, Hojatoleslam Kazim Sadeghi, says women and girls who "don't dress appropriately" spread "promiscuity in society." "When promiscuity spreads, earthquakes increase," he says in a video posted Monday on YouTube, apparently of him leading Friday prayers in Tehran, Iran, last week. The video was posted by YouTube user "electionlies," who appears to be anti-regime. The account features wallpaper of a blindfolded woman apparently weeping blood and the slogan, "The green movement is alive." Green was the color of anti-regime protesters in last year's demonstrations in several cities across Iran. The protesters were marching against the country's election results, which gave President Mahmoud Ahmadinejad a second term in office. Sadeghi is a senior cleric who was appointed last year by Supreme Leader Ayatollah Khamenei as a substitute Friday prayer leader in Tehran, an extremely influential position. Iran suffers regular earthquakes, including a devastating one that destroyed the ancient city of Bam in 2003, killing tens of thousands. Sadeghi is not the only religious leader to have linked earthquakes with human behavior this year. American televangelist Pat Robertson suggested that January's devastating earthquake in Haiti was because of a pact Haitians made with the devil in order to throw off French rule in the 18th century. A spokesman for Robertson said he was referring to a widely discussed Haitian legend, but University of Miami researcher Kate Ramsey said the legend was "utterly a fabrication, and it's an extremely offensive one."